It goes without saying that one of the major limitations for independent game developers, unless they are able to find funding from a major publisher, is the amount of money available to them. There’s simply no way most small teams can achieve anything on the level of AAA heavy-hitters given their budgets — titles like Hello Games’ No Man’s Sky blow people away precisely because they’re an exception to the rule. Unfortunately, there seems to have been a misconception developed that indie games cannot achieve beauty or sophistication in spite, or even because of, their monetary limitations. 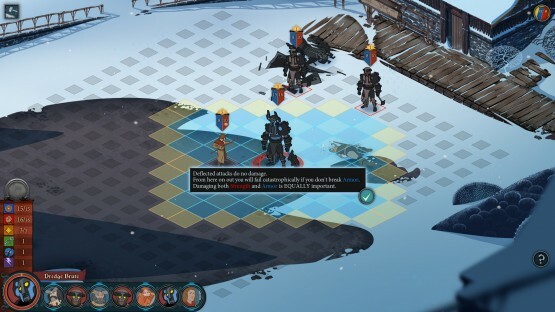 Perish the thought: games like Stoic Studio’s The Banner Saga prove this idea to be a false one right from the moment you begin. It may not have all the bells and whistles of the AAA strategy RPGs in the world — your Final Fantasy Tactics and Fire Emblem titles, for example — but it’s a brilliant and frequently beautiful achievement in its genre, and it works just as well on PS4 as it did on other platforms two years ago. I won’t go through all the usual details of our reviews by giving a plot summary here, because that would spoil a major part of what makes The Banner Saga so much fun. Stoic set out to weave an epic, character-driven narrative — the kind that has kept people glued to their televisions for Game of Thrones — and, for the most part, they’ve succeeded. The premise of the story, which follows two conflicting races (humans and horned giants known as Varl) as they fend off assaults from the evil Dredge across a Viking-inspired landscape, might tempt the wearied fantasy reader — or perhaps those resistant to the charms of sword-and-sorcery epics — to roll their eyes. And yeah, it’s a pretty familiar story, but Stoic hits just the right notes in making it both totally accessible and compelling enough to woo a varied audience. That’s probably based on the strength of its bizarre personalities, who each come with the complexities of real people: flaws and all. Mary Sues need not apply. Oh, and the story changes depending on the choices you make, too. That’s not just some marketing line — party members and other major characters will live or die depending on what you do, and the people you come into contact with change depending on the path you take through the game’s expansive map. Naturally, this brings a significant amount of replay value to the proceedings: when you first begin the game, it’s fun to see where your spur-of-the-moment decisions lead; upon repeated playthroughs, you can be a little more selective about who you welcome into your ranks and figure out which path works best for your playstyle. When you really dig into it, you start to realize how remarkable it is that Stoic managed to inject so much strategy into the part of the game that doesn’t take place on the battlefield. Of course, that area has plenty to offer as well: when it comes to the meat and potatoes of The Banner Saga’s gameplay — tactical RPG combat — it’s clear the developers have learned from the best. The battles will feel familiar to anyone who’s tackled previous greats in the SRPG genre, whether that’s Final Fantasy Tactics, Ogre Battle, Shining Force or even Disgaea. In a nice twist, though, the game manages to achieve one of the toughest balances out there: its core mechanics, while simple, combine to form a deep and complex metagame. To be more specific, you won’t need to get caught up with managing a ton of skills, spells and statistics when it comes to your party — the battle system brings everything down to an elegant game of numbers, where four primary parameters and a handful of abilities are all you need to have a good time. This may feel a bit too basic at first for some players, but once the layers peel away it’s clear that there’s plenty of challenge to be found in the game’s beautiful simplicity. It’s a shame, then, that I was sometimes left wishing that simplicity were better explained, and that challenge better paced — lapses in explanation where tutorials would have been helpful can throw your groove off the first time you play, and a few frustrating difficulty spikes across the campaign serve as jarring irritations. All in all, though, these shouldn’t put too many players off the great stuff there is here. So, remember that “beauty” misconception I mentioned earlier — you know, the idea that indies can’t achieve aesthetic sophistication on the level of AAA games? Toss it right out the window. The Banner Saga lacks a lot of the luxuries gamers have come to expect in recent years — the voice acting is limited to small monologues delivered intermittently during “travel” portions of the campaign, for example — which might leave some players with a bit of a bleak impression. But this is a brutally harsh and unforgiving Viking-inspired world, after all, so perhaps “bleak” is right where it needs to be. In any case, there’s no denying that the artistry on display here is a thing to be savored, from the colorful, well-defined portraits of recruitable characters to the painterly backgrounds with unbelievable detail. The animation, while simple, is also effective thanks to the dynamic and detailed nature of the original illustrations. The game’s score is also pitch-perfect, using traditional instrumentation to great effect and with a real ear for both melody and ambiance. 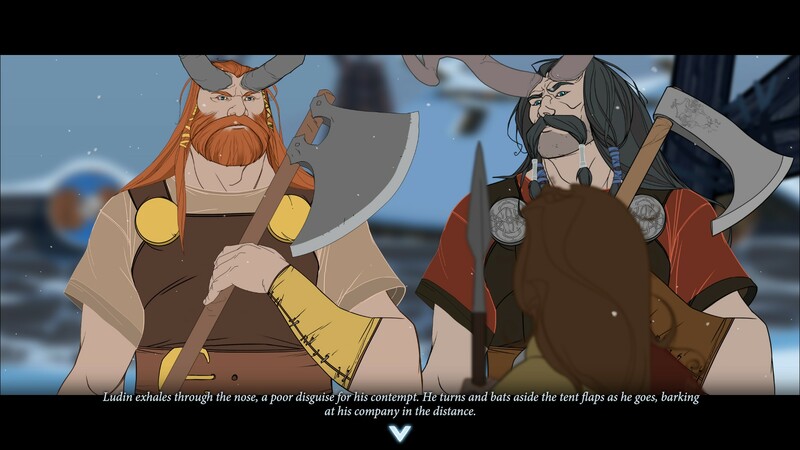 If you’ve got a hankering for strategic role-playing and an epic narrative with plenty of player choice, The Banner Saga should become one of your priorities on PS4. The combat, while a little uneven difficulty-wise across the game’s campaign, nevertheless manages to hit the sweet spot between simple accessibility and strategic depth. You’d also be hard-pressed to find an indie with as much artistic inspiration: gorgeous character art, painterly backgrounds and an exceptional put to rest the misguided notion that indies can’t turn out aesthetic appeal on a limited budget. Sure, it’s not always perfect — the game’s lack of guidance, difficulty spikes and voice acting may occasionally leave you feeling a little lost and alone — but perhaps that’s just in keeping with the unforgiving Norse world that inspired it. 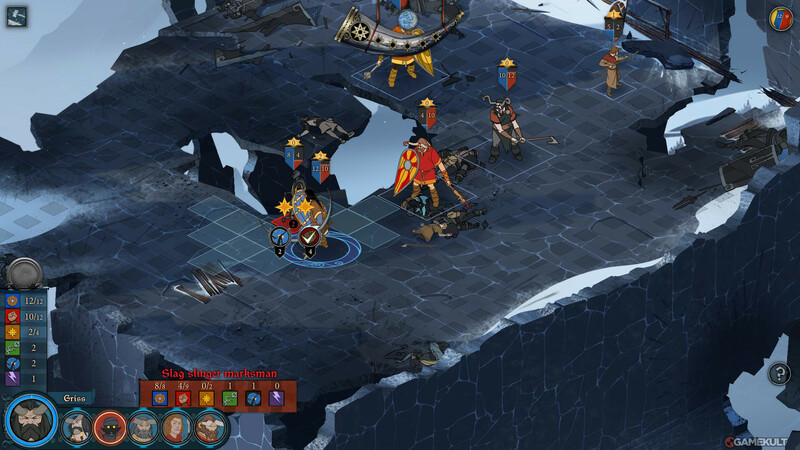 Review code for The Banner Saga provided by publisher. Reviewed on PlayStation 4. For more information on scoring, please read our Review Policy here.